As it gets colder, I'm discovering that normal socks are no match for the coldness of my hardwood floors. Not being much of a slipper person, I made these worsted weight socks. They are too thick to wear with shoes, but they are perfect for keeping my toes warm around the house. 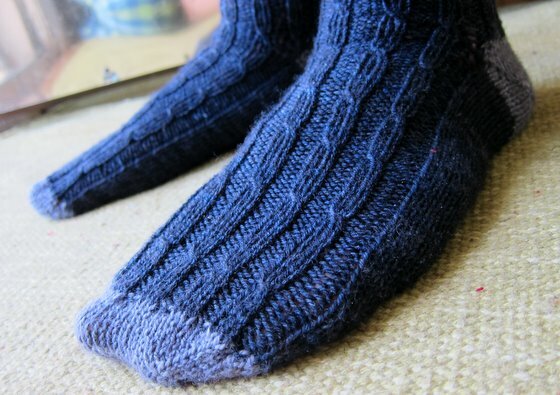 These socks are knit toe up with a short row heel using the magic loop method. They are a very fast knit - I'm a slow knitter and completed them in less than a week. The pattern includes charted and written instructions. Create a slip knot. Cast on 24 sts in addition to the slip knot (12 on needle, 12 on cable) using Figure 8 cast on. Knit even one round. Do not knit the slip stitch. When you come to it, just drop it off and pull the slip knot out. Repeat rows three and four 5 more times. There will be 7 wrapped stitches on each end. Now we need to pick up the wrapped stitches.